About 38 (42, 46, 50, 54)" (96.5 [106.5, 117, 127, 137] cm) bust circumference, with 3½" (9 cm) opening at front. Cardigan shown measures 38" (96.5 cm). Bold modern cables, evocative of the depth and swirls of a Thomas Hart Benton painting, really pop in O-Wool Classic Worsted. 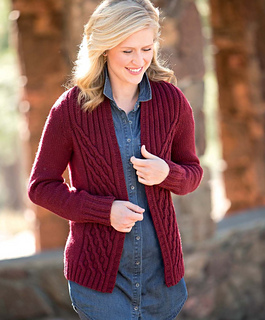 This cardigan is worked seamlessly from the bottom up with a hybrid of raglan and set-in sleeve shaping that transitions to a cozy shawl collar. I chose to leave this cardigan open, but a few buttonholes can be added to the front band if you prefer a cardi with closure.